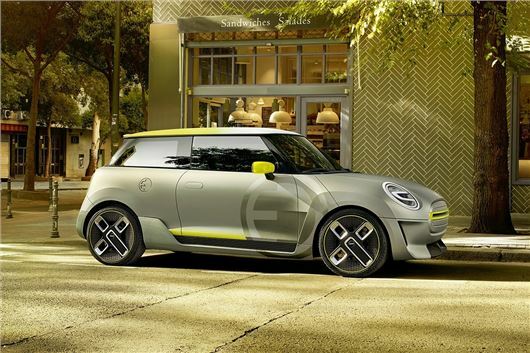 MINI has revealed an electric concept, which previews a production car due in 2019. There isn’t much information about how the car will perform, what range it will have or indeed what the interior will be like – but it does give a clear indication of what the next-gen MINI hatchback will look like. The body shape is very much like that of the current model, but the detailing has been cleaned up. That means there are no chrome elements, nor embellishments on the front wheel arches. The arches themselves have been bolded up too, while other typical trinkets associated with MINI, including the chrome grille surround, have been removed. It’s a much cleaner, classier design. There are some very “concept car” features, like Union Flag brake lights, but essentially this shows the style direction for the facelifted MINI – and not just the pure electric model. This is, in theory, what the conventionally-powered models will look like too.